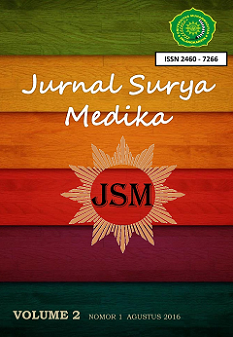 Starting from Volume 5 Number 1 September 2019 edition, Jurnal Surya Medika (JSM) make changes to the template in the article that will be published. The change aims to make it easier for readers to observe important parts of each page of the article. The latest article format can be downloaded in the Templates section. The publication of Jurnal Surya Medika indeed participates in disseminating the results of research and review of science and technology development conducted by lecturers and researchers especially from UM Palangkaraya and other universities. This edition contains nine articles consisting of Pharmacy, Medical Laboratory Technology, and other Health Science topics. Jurnal Surya Medika (JSM) is a Scientific Journal managed by Faculty of Health Science Universitas Muhammadiyah Palangkaraya and published twice a year (in February and August) by Institute for Researches and Community Services Universitas Muhammadiyah Palangkaraya. The aim of this journal is to publish high-quality articles dedicated to all aspects of the latest outstanding developments in the field but not limited to Pharmacology-Toxicology, Pharmacognosy-Phytochemistry, Pharmaceutical, Analytical Pharmacy-Medicinal Chemistry, Natural Product Development, Clinical-Community Pharmacy, Management Pharmacy, Medical Laboratory Technology, Clinical Chemistry, Microbiology-Parasitology, Hematology, and other General Medical Aspects. It was first published in 2018 using Open Journal System (OJS). Editors accept submissions of the well-prepared manuscript that have not been published in other publications. The manuscript format and requirements are listed on the back cover page. Incoming manuscripts will be evaluated and edited for the uniformity of formats, terms, and other writing procedures. Jurnal Surya Medika (JSM) by Institute for Research and Community Services Universitas Muhammadiyah Palangkaraya is licensed under a Creative Commons Attribution-ShareAlike 4.0 International License.